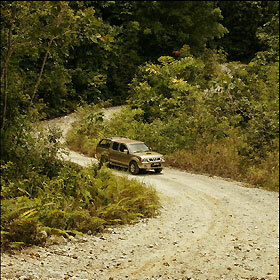 Relax in air conditioned comfort for our off road adventure on unmade roads and jungle tracks. From ancient volcanoes and earthquakes to gold fever and a massacre this area has more than its fair share of history which we will describe to you during the journey. We start at the village where James Brooke acquired Sarawak, visit Baa'uh and Bau (it means 'smelly' but it normally isn't that bad!) 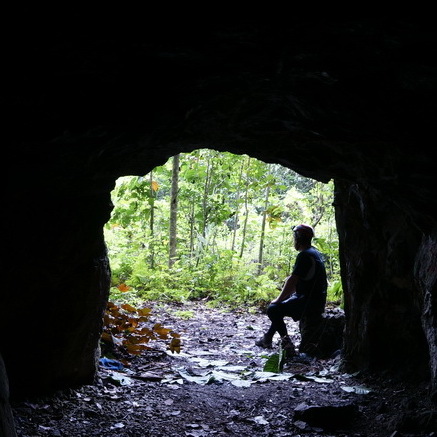 and on the way we will visit 3 different types of gold mine (all abandoned), the winding passages of the Wind Cave , the only high density fossil beds in the area and a remote Bidayuh village Bidayuh style lunch is served at our own place on the farm. And if you have an interest in plants we pass a colony of the Pitcher plant 'Nepenthes Northiana' which only grows in the Bau area. The adventure as described in a Pajero. Photos of you taken during the trip plus photos from our library sent to you by email. Bidayuh style lunch and water throughout the day. Please tell us about special diet requirements in advance. Sun block, sun hat, towel, insect repellent, change of clothing, walking shoes with good grip, sandals. Kuching Offroad reserves the right to alter an itinerary or cancel a tour due to inclement weather or unforeseen operational conditions for the safety of guests.We accept no liability or losses due to failure to connect with other services and cannot be held liable for personal accidents, loss of baggage or personal item, illness or death resulting from activities which is beyond our control.We reserve the right to decline a booking or to refuse entry to accommodate any person(s) or group who in our opinion, are not suitable to occupy. In this case no reasons will need to be given and the contract shall be discharged without further liability on either party.When making a reservation you are agreeing to be bound by these Terms & Conditions at all times. ~ A growing selection of adventures and expeditions which are graded according to physical difficulty and technical experience required. ~ No more than 6 guests in a group. A single expedition may have more than one group. Pricing & Service Charges All rates stated in the website is inclusive to 10% service charge and 6% government tax unless specifically mentioned. We reserve the right to make changes to their pricing without prior notice. Personal Property Kuching Offroad shall not be held liable for the death, sickness or injury to any guest or for the loss, theft or damage to any guest property however sustained or caused delay or illness howsoever caused to the guest whilst on their trip. It is the responsibility of the guest to ensure that their belongings are secure at all times. 1 Am I Fit Enough? If you can climb 2 or 3 flights of stairs and walk a mile then you are fit enough for the easy expeditions. Intermediate expeditions require a higher fitness level but you don't have to be superfit or superman. Advanced expeditions are harder. Check the rating and fact sheet for the expedition which you are planning to do for a description of what the expedition entails. If you are a visitor to the region you will find that dehydration is a threat so drink plenty of water.. 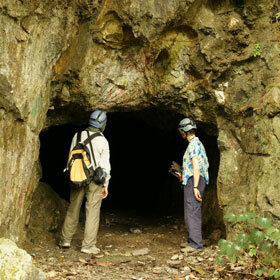 Going jungle trekking or caving before you have had a chance to acclimatise will reduce your effectiveness. 2 Am I too old (or too young)? 3 I have a medical condition. Can I go caving? Firstly, we strongly recommend that you see a qualified medical practitioner if you have any doubt at all about your state of health before going caving. In any event please inform us at the time of booking if you suffer from obesity, coronary heart disease, any condition which results in shortness of breath, epilepsy, disorders affecting your balance, loss of vision which is not corrected by spectacles or contact lenses, arthritis and other debilitating physical conditions or any other medical condition which may affect your ability to safely go caving. 4 Will I be Safe? We go to great lengths to make your experience a safe one and have had no guests or staff members suffer injuries requiring medical attention to date. There are many caves in the area in which rock falls and floor collapses are a danger which we avoid and our route planning, preparation, equipment maintenance and guide training are designed to keep you safe. Accidents and illness can always, however, happen and we are prepared for them if they do. 5 How do I get there? Make your own way to a meeting point - we will send you a map. All meeting points are on major roads and are within an hour of the International Airport. Your tour operator provides transport to the destination along with other services. We arrange transport for you. There will be an additional fee unless the package includes transport. 6 Are the local people involved? Yes. Our company is majority owned by Bidayuh interests and is part of the local community. Local villages hold the rights to the caves which we use and, in every case, benefit from your enjoyment of them as follows. 1 A proportion of the fee paid by every guest is paid to community funds. 2 Our guides are hired from the local community. 3 Local businesses are used to support our operation. Please note that guests wearing inappropriate footwear (flip flops, high heels, light weight sandals) will not be allowed to enter the caves. 8 What should I bring with me? All guests should bring a towel, insect repellant and spare T shirt. you should also bring old clothing and footwear to cave in and a small pack. 9 What about the environment? 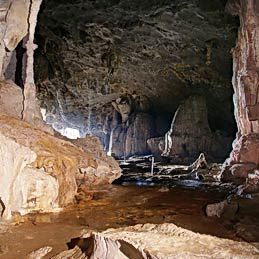 * Most caves are used infrequently to avoid continuous disturbance * Guests are asked to follow our guidelines to minimise cave damage and disturbance * Where human traffic can damage the floor we monitor the state of the floor and take appropriate action if damage is noticed * Of the many caves to which guests could be taken only a small percentage are used for tourism * In some cases rubbish has accumulated in the caves. All caves which we visit are given a clean up before being brought into use * Our activities therefore have a nett positive environmental impact. 10 What about valuables, electronics and personal equipment? If you don't need them with you we suggest that you leave them behind - we cannot guarantee their safety in the cave environment. Bring a water proof bag for cash and any electronic devices you decide to bring. Photography is not permitted inside the caves but there are no restrictions outside. If you wear glasses secure them around your neck with a cord. 11 What can I do and what can't I do? Most importantly - enjoy the experience! 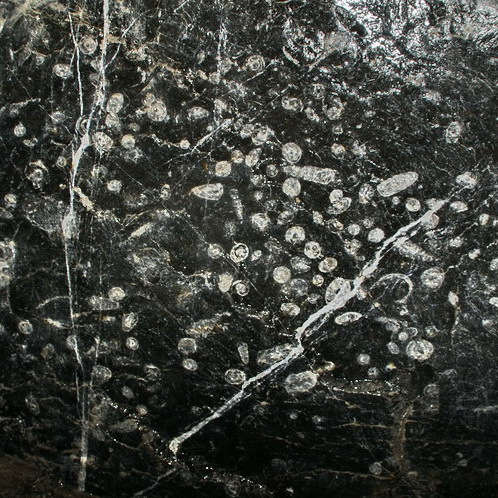 But, for your own safety and the protection of the cave environment: leave nothing which you have brought in behind. Take nothing out that belongs in the cave. Follow your guides instruction at all times. Do not smoke. Do not eat food which you have touched with your hands until you have thoroughly washed them. Do not rush. Do not shout. 12 What about accidents, rescue and insurance? Your safety is our number 1 priority however accidents and illness can happen and we are prepared for them. At least one of our expedition staff will have first aid training and our policies determine what steps are to be taken in the event of illness or injury. Our policies cover initial treatment, obtaining assistance, evacuation and hospitalisation. This may involve emergency services, private paramedics and cave rescue teams. We therefore recommend that all guests have valid personal insurance cover.